Danielle's Bulimia Recovery Story Update! BlogHome » Blog » Eating Disorders » Danielle’s Bulimia Recovery Story Update! This is a follow up post from my friend and fellow recovered bulimic, Danielle from Texas. Danielle shared her new-found bulimia recovery story a year ago. She emailed me over the holidays to share an update. I was so excited when I read her message I was jumping up and down and she agreed to allow me to share it with you. Thanks Danielle! What I love about what Danielle has been through and shared candidly is that recovery isn’t like this “after life” that happens when you die. You don’t die and go to recovery heaven. What I do want you to listen for in Danielle’s story (and every one of our bulimia recovery stories) is that in recovery you’re still YOU. You have up days, down days and in between days. You have struggles and things not going your way. You have things that excite you and turn you off. You get a lot of what you have now with one significant difference; you don’t turn to food to escape when things don’t feel good. Or when you’re bored. Or when you don’t know how to cope. 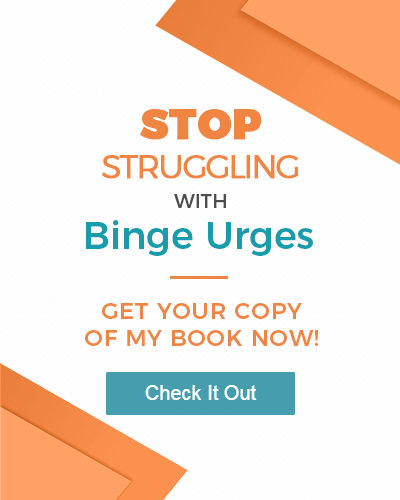 You have new skills, new rituals, new practices and ways of being that replace your old bulimic urges. I hope reading Danielle’s update and more eating disorder stories on my website will help you get the inspiration to take courageous action this year. Hope you had a wonderful and very merry Christmas. I can’t believe this was my 2nd year abstinent!!!! It’s now been over a year and few months that I began my recovery, which was August 1, 2011. Wow, it’s amazing to realize that’s how long it’s been. It’s gone by quickly, but as I look back there have been sooooo many ups and downs. What an incredible journey, and I’m still traveling. Reflecting back on where I was in my recovery last year versus this year is really quite incredible… last year I was in a very new and “insecure” relationship and fell off my self-prescribed “no sugar” wagon right at Christmas. I continued to stay off the wagon and went from not having any sweets for 3 months before the holiday, to having many treats all the time afterward and for several months after. My relationship fizzled out soon after the holiday, but it’s literally taken me up until recently to feel better with my approach to food. I’m still working on it, but I really did learn a lot about myself. On Aug 1, 2011, I was initially very strict in my abstinance, not allowing myself sweets or anything I considered a trigger. After the holiday slip, I decided to throw all caution to the wind and just let myself eat… everything! lol. I really let myself go with all the sweets I wanted and faced my fat fears. I let myself even overeat and feel full and uncomfortable, and most importantly, did NOT purge! I just let myself be full, uncomfortable, and dealt with it. After months of allowing myself to have all the binge/trigger foods I wanted, I finally started to feel the urge to get more “healthy” and put myself on a 4 week sugar free goal, just to give my body a break and feel sound of mind again. I am just wrapping up my last week of this sugar free period, allowed myself a break on Christmas Day,and realized for the first time in ages that I’m a very strong and awesome being! It feels good to know how food affects me and my brain,and realize that sugar and sweets were really affecting my emotions. I want to take what I’ve learned into next year and finally let sweets be just a treat, and not the primary base of my diet, but also not punish myself for enjoying all the wide variety of foods that this world has. Yes, food does matter but it is not who I am! What I eat does make me feel good or bad and I want to always feel good. With that said, I learned over the last few months that I can choose to eat whatever I want and deal with the consequences – eating sweets all the time is fine, but I felt like crap. Eating protein focused meals makes my brain function better and my body feel better, and I think in the end that matters a lot. Happy tastes better than anything! I’m happy when my body, mind and spirit are all in sync. Looking forward to next year, and keep in touch. You are such an angel in my life!